Advanced and evolved for a new level of dependability and comfort, Undercover's latest canopy package takes the innovations of the company's previous models and combines them into a package deal that's almost dripping with features. The lightweight, easily portable combination aluminum - steel frame is topped by a 300-denier canopy that's resistant to the sun, to stains, and even to fire. And everything comes complete in one of Undercover's advance zippered rolling bags. For the ultimate in canopy shelters, go Undercover. * Please Note: This product is designed for use in fair weather only and must remain sufficiently anchored at all times. Do not leave this canopy unattended for long periods of adverse weather such as rain or high winds. * Also Note: Flame Certification: This item meets both CPAI-84 and NFPA-701 Flame Certification. The top features only a CPAI-84 tag. The manufacturer'sFlame Certification s can be downloaded from this page. * Flame Certification: This item is CPAI-84 Flame Certified and NFPA-701 Flame Certified. What colors are available for the UC-3R10WV? Is this 46 pounds with the side walls? This canopy is only available in white. The weight of 46 pounds does not include the side walls but the side walls will add only 4 pounds at the most. Do the four sidewalls connect to each other by zipper with one panel having the door? Also, do the panels connect to the valance by Velcro the full with? Yes, the walls have Velcro tabs along the edges, as well as zippers. The Velcro tabs will secure the loose edge to the pole. This makes it possible for you to remove the open end panel and still have walls securely attached to frame. What does "300 denier polyester top" mean? That is the thickness of the top. The higher the denier, the thicker the top. 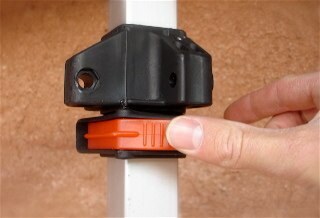 Is the leg extension release a pull pin, toggle or a button? 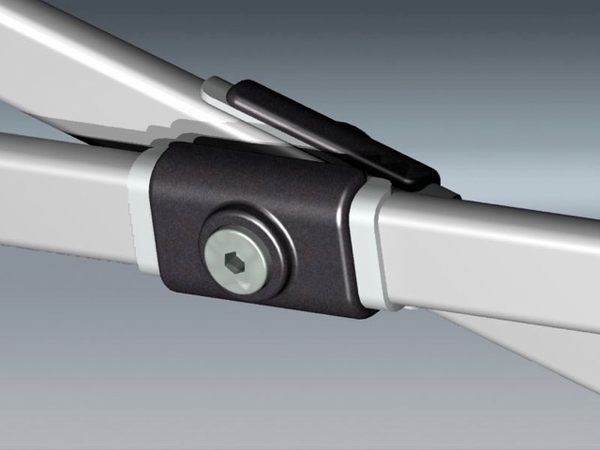 This canopy uses push levers to adjust the leg height as well as to lock the frame in place during setup and take down. For more information, please see the page listed UC-Tek in the manuak. 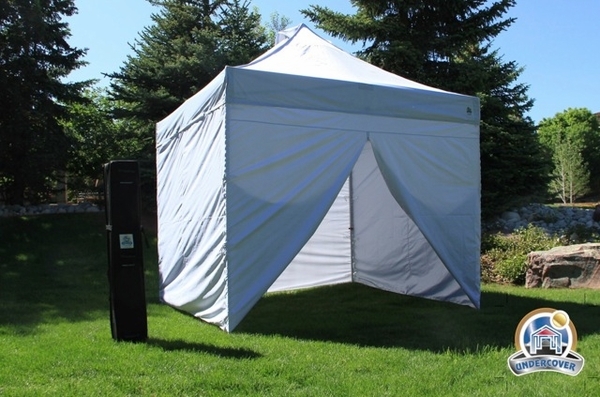 Are the 10x10 Commercial Popup UC-3R10WV sidewalls Polyester or Polyethelene? The side walls on this product are Polyethylene. Do you have weights that I can use to secure the legs of my Undercover Canopy? Yes. I recommend the Set of 4 King Canopy Weight Bags. Please note that they do not come pre-filled. You would fill them with gravel or sand. They hold 30 lbs each. What are the dimensions of this product when folded up and in its roller bag? The packed dimensions in the roller bag are 64" x 12" x 14". The weight is 59 lbs. 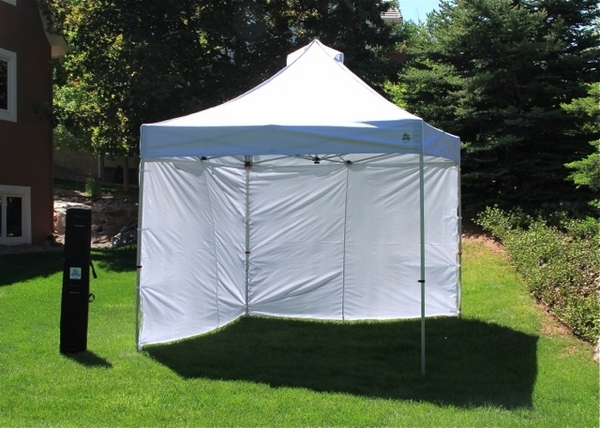 Does this tent come with a front awning, or is there one available for purchase? Unfortunately, no. 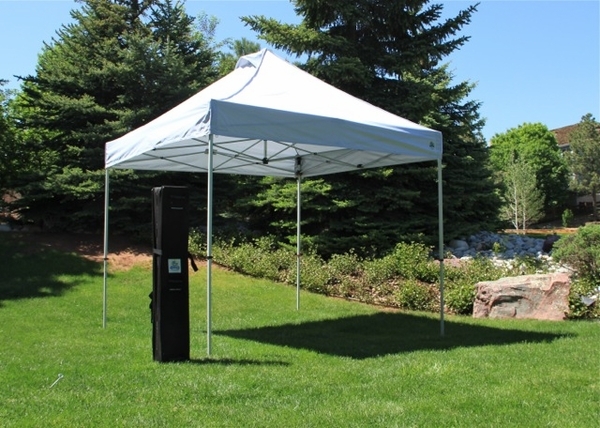 The only pop-up canopy we sell with an awning is that E-Z UP 10' x 10' Aluminum Canopy Tent Package. Easy to set up and light weight. This is great! Exactly what I need for Art shows. I love the way the side panels connect to the top and also to each other. The roll up feature of the side panels is super! It's much lighter to carry than other ones but actually more sturdy. The carrying case with wheels is really easy to maneuver.. The canopy worked as expected. 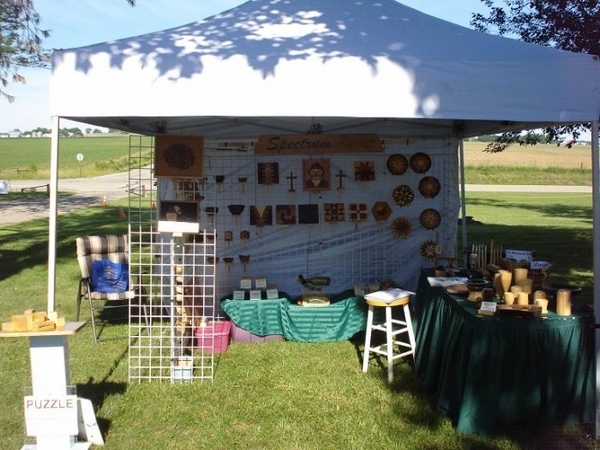 I participate in Arts & Crafts shows and the canopy provided protection from the weather and surely attracted people to see the items on display. It was easy to install, though as the manual states, it does go up faster with two people. The four side panels installed easily and protected my display overnight. Love this product. Started off with a starter tent from Walmart like most of us do to see if we are going to continue doing outdoor shows. So upgrading to the Undercover tent was quite an eye opener. Instantly you see you are getting your money's worth. Already have been in a light rain with this tent. EZ Up will form pools of water on top even with minimal rain. Saw 2 EZ Up canopies collapse when rain got heavier. Undercover tent - No rain pools on top so no chance of top collapsing. Not quite as easy as video shows for one person to put up if person is a small woman but can be done. Just pace yourself or you will be worn out before you start. Having said that, other tents absolutely cannot be put up by one person. Highly recommend. I have used this tent once at a craft show and once at the beach so far. It's fairly simple to set up/down, and carry around on the wheeled bag. It's heavier than a light weight tent, I imagine, but it has the advantage of stability under wind conditions. It's a perfect fit for my needs so far, and seems like the best lower priced high quality item. 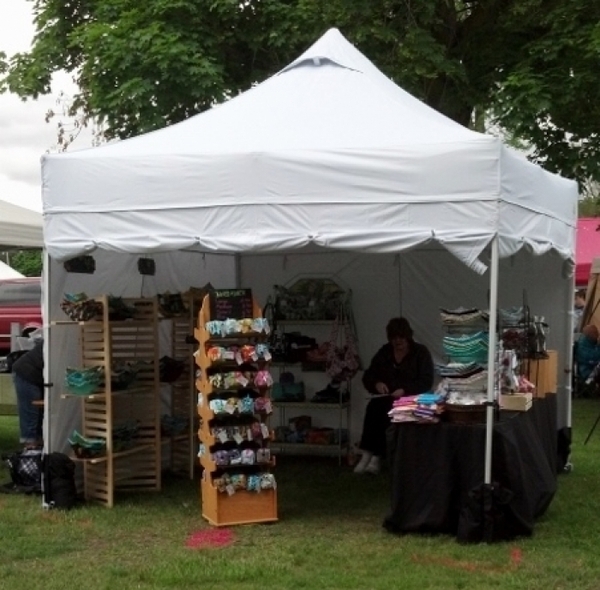 I have recommended this tent to a friend who does craft shows. Thank you! Very happy with my tent. I ordered a different tent (not from this company!) that arrived broken in the box and was so heavy I could barely lift it. 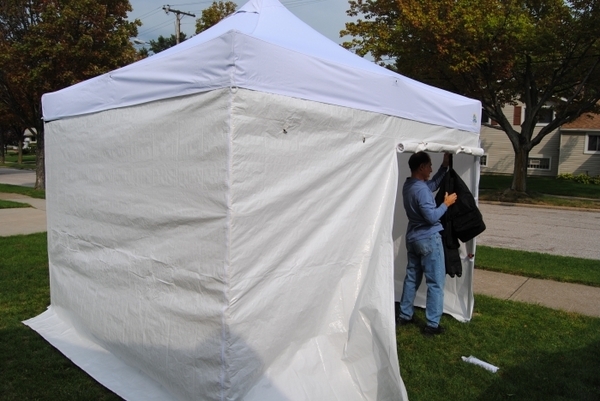 This Undercover tent is easy to set up and close with two people, but if I had to I could do it myself as well. I'm an outdoor vendor so having a good tent that I can manage is essential. Very happy with this one! ProsActually fits perfectly back in the carrier so easy to load/unload. Definitely easy with two people, but possible to do by yourself. I saw a review that recommended getting the bags for putting sand/water/rocks in to help stabilize it better with the wind and was glad that I took their advice. I do like the canopy overall! Easy setup- did it solo. Seems to be quite durable. have not had it out in wind or rain yet. ProsEasy to set up. Wheeled bag is handy. Side walls easy to apply. ConsA bit heavier than I expected. We've used it only once but the set up was easy....there were three of us, though two could do it just as easily...personally, I'd rather not do it by myself but I think it's possible. Just as a previous reviewer mentioned we too were at a fair and it was in the 90s. I couldn't understand, from the comfort of my canopy, why everyone kept saying how hot it was! It was warm, but I was totally comfortable and we were working all day from 9-5pm....heat of the day. I'm pleased with the quality of the fabric on the canopy itself and the locking mechanisms. It repacked exactly as it came out of the travel case and wheeled away just fine. You get what you pay for! ConsNothing. Used it once and love it so far. It was bigger than I was thinking it would be but I set it up as soon as I got it. Love it. Nice, strong, and easy to put up. One person is all it takes. Very well made, easy to set up, strong well made frame. hold up really well against some strong gusting winds when used with the gravity tube kit. highly recommended for commercial vendor use. This tent is great! I was able to set it up by myself in windy conditions & I love the side walls w/ the zippers- definitely a plus. Easy to take to market! This tent package has almost everything you need, the tent top, four walls (one wall has a zipper door), pop-up legs with easy to use hardware that won't pinch your fingers, anchors, and a heavy duty wheeled bag that holds everything. It does not include weights to stabilize the canopy if you place it on a paved surface (you can use small sandbags for weights, or buy weights specifically made for canopy tents). It fits in the trunk/back of our two-door coupe with the seat folded down. The price was outstanding considering everything that is included. One person can set up this tent, but setup is much easier with two people. We will use this tent when selling at farmers' markets. This item is so much better than the tarp we used to use. I wish I would have purchased this long ago! It's also easy down! ProsFast to put up, and take down. Excellent product. I would buy another one in a heartbeat. Very sturdy, easy to anchor, fabric is rugged, stitching seems solid. I love the quick-release clips for leg extension and canopy locking. My teenage son and I had no experience with this canopy and set it up in 2-3 minutes. Tear-down was simple and intuitive. ProsSimple setup. Good structure and canopy/valance fabric. Holds up well in the wind. ConsSidewalls are cheap, but will do the job. I have been doing outdoor art shows for 7 years dodging the weather. After being in a downpour, I took the plunge and invested in a tent. I did my research and glad I spent the extra money on the sturdier canopy. It's a little heavier, but there is always someone around to help me get in in and out of my vehicle if I need help. ProsI love the side wall options, carrying case holds everything and the stakes are included in price. ConsA tad heavy for my small frame, but worth the better materials. This canopy is even nicer than I thought it would be! It is made to be put up by just one person! So nice, since I usually work the farmer's markets I do by myself. The cheaper canopies I used to use just didn't last past one season, and by the end of the season at least one arm or leg was broken. 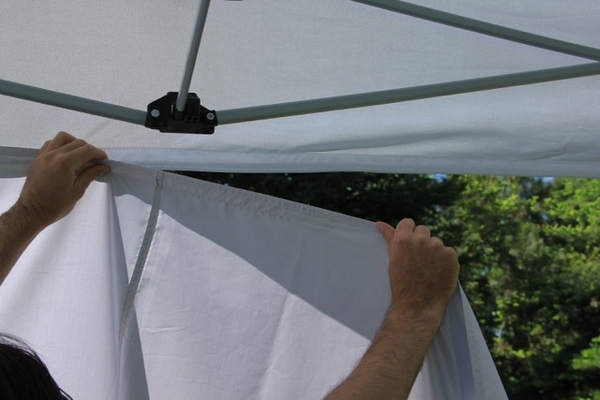 With the middle support, letting you open the tent with one person, you can also move the fully open canopy around by lifting it in the middle. It is definitely bigger and heavier than the other canopies I've had before, but much sturdier, and the bag much sturdier, too. Great Quality for an Amazing Price! I was nervous about buying this because there is only two reviews. Since they have a return policy, I thought I'd give it a shot. I'm glad I did. I ordered this around noon on Tuesday and it arrived around 6pm on Friday shipped all the way from CA to MD. The wheeled bag is exceptional quality and looks like its built to withstand lots of use. The canopy attaches to the frame in each corner with Velcro and a snap (I think its for cosmetic reasons) half way along each side. It went together very easy. Although it required patience, I was able to put it up myself. The walls attach with Velcro and each end has a zipper so they all close together. The frame is very sturdy and improved. The description doesn't say, but the packing indicates that the material is waterproof but seams are just water resistant. It does recommend spraying sealer on it the seams from time-to-time.